Dr. Supriyo Datta is a leading figure in the modeling and understanding of nano-scale electronic conduction. With Mark Lundstrom, he has pioneered electronic-flow prediction in ultrasmall devices. His early work laid the foundation for quantum-transport simulation tools based on the non-equilibrium Greens function formalism. He also is well known for his seminal contributions to such emerging fields as spintronics and molecular electronics. A Fellow of the IEEE, the American Physical Society and the Institute of Physics, his many honors include the National Science Foundation Presidential Young Investigator Award and the D.D. Ewing Teaching Award from the Purdue University School of Engineering. A distinctive aspect of his style that contributes to his effectiveness in teaching is his emphasis on critical thinking, in addition to technical problem-solving skills. 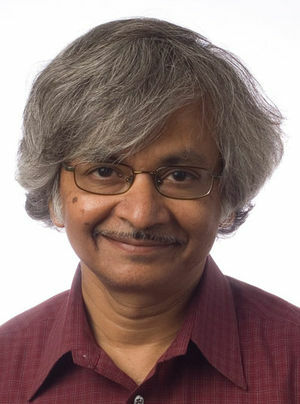 Datta's classroom lectures have been videotaped and made available to students around the world by the National Science Foundation-funded Network for Computational Nanotechnology through the nanoHUB, a Web site serving nearly 10,000 users per year. Dr. Datta is the Thomas Duncan Distinguished Professor of Electrical and Computer Engineering at Purdue University. This page was last edited on 29 February 2016, at 17:08.